When you learn how to make the ranch salad dressing recipe you will see it is more than a salad dressing. It is actually used more often as a condiment than a salad dressing. Some of the ingredients commonly found in this dressing are garlic, onion, chives, parsley, dill, paprika, mustard, salt and pepper. All or some of these herbs and spices are usually blended with buttermilk, mayonnaise or sour cream which produces a fabulous flavor. When I learned how to make the ranch salad dressing recipe I found it is great to serve as a condiment with many dishes. Hot Buffalo wings just would not be the same without a bowl of this dressing for the dip. French fried potatoes, French fried green beans and French fried onion rings also need a bowl of this creamy dressing for dipping. Then there are all the vegetable appetizers and other appetizers that demand this dressing for dipping. 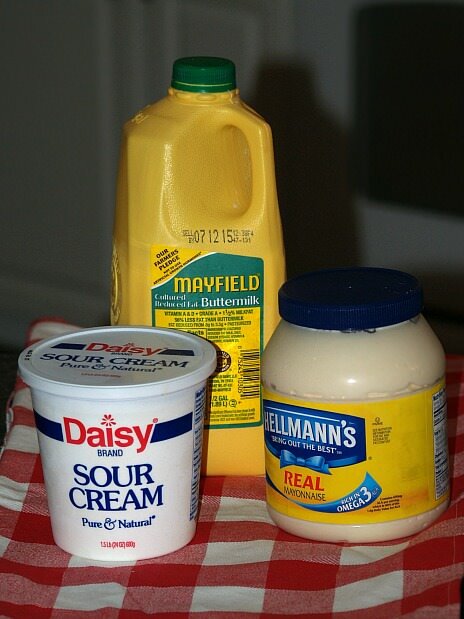 I learned how to make the ranch salad dressing recipe because it happens to be my favorite for salads. The origin has been traced to a dude ranch; the Hidden Valley Ranch in California. This recipe was served there to the guests and they began bottling it so the guests could take some home. It began as a basic sauce of mayonnaise and buttermilk with seasonings. It spread like “wildfire” because the flavor is so good. Today there are many different versions using various ingredients. Experiment with your favorite seasonings. Whisk together all the ingredients until well blended. Cover tightly and refrigerate for 1 hour to let flavors blend. This classic dressing is made with a combination of mayonnaise and sour cream. Combine the mayonnaise, sour cream, vinegar, lemon juice, parsley, minced onion, chives and garlic. Whisk until well blended and add salt and pepper to taste. This recipe has a little horseradish added to “spice” it up. Combine and mix together the sour cream, onion, garlic and salt until thoroughly blended. Great on salad greens or as a vegetable dip. This appetizer recipe is great with the ranch style sour cream sauce recipe. Using frozen breaded chicken fingers place on oiled tray in oven. Bake 20 minutes on each side or until golden brown and crispy. Serve with following ranch style sauce. 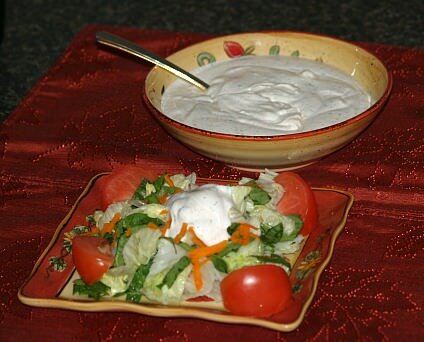 This is similar to ranch dressing which can be used as a raw vegetable dip or on a salad. Combine and mix all ingredients; chill and serve with raw vegetables. Combine and blend; serve with about 4 cups mixed salad greens. Combine all together and blend well.